The San Marco Hotel is located 4-5 km north of the town of Mykonos, on the shores of the exclusive and archaeologically preserved Houlakia Bay. Within easy reach of the town islands popular beaches, guests staying at the San Marco can easily experience the Mykonian jetset lifestyle whilst enjoying the tranquility of a true Cycladic island setting. Discreet but attentive service in an elegant and traditionally Mykonian environment make the San Marco an ideal choice whether of business or pleasure. The hotel consists of 86 spacious and beautifully appointed rooms including VIP Junior Suites, a range of traditional lofts, an extensive number of Junior Suites, as well as deluxe and classic Mykonian rooms. All rooms are equipped with direct dial telephone, air conditioning, bathrooms/showers with hairdryers, mini-bar satellite TV & safe. The suite collection includes dvd players and extra amenities. All rooms and suites have private balconies or verandas offering fantastic sunset views over the Aegean Sea, the mountains or the landscaped gardens. At the San Marco we take pride in exceeding our guests expectations. Enjoy a full American buffet breakfast to start your day soak up the sun on the pool deck or enjoy the fresh, reviving waters of Houlakia Bay. A light snack by the pool bar, or an expertly prepared sundowner before dining in the a la cart Veranda restaurant. 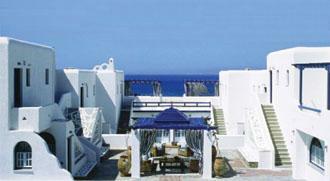 Complimentary all day shuttle service to and from Mykonos town for all individual guests. The hotel also offers reviving beauty treatments, massage, hammam, hairdresser service, gymnasium, floodlit tennis court, billiard, children’s playground, guest laundry, internet access, traditional kiosk and church. Our concierge can also arrange scuba diving, horse riding, sailing, water sports-or even one day excursions to nearby islands. A variety of indoor and outdoor venues with breathtaking views over the turquoise waters of the Aegean and creative settings make for memorable meetings and festive occasions. Conduct your conference in a traditionally Cycladic conference centre with up to date AV and technical equipment, ideal for meetings up to 130 pax. The success of your event is ensured by our efficient personnel as well as our attention to finding our your needs well before your first delegate or guest even sets their foot on Mykonos.